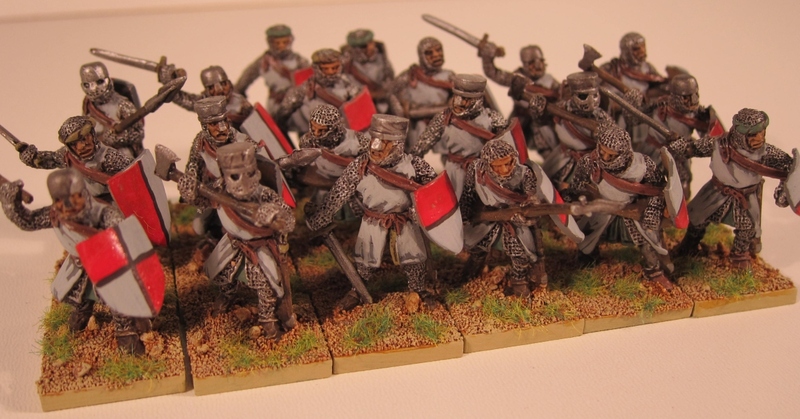 A unit of 20 Dismounted Knights from Black Tree Design, 3rd Crusade. The army deal provides a nice mix of sculpts with few repeats. Flash was minimal & sculpting detail is adequate. Where have I been? For those of you reading CTF, it’s been more than a year since my last post. In the past 12 months, I’ve moved to a new home, sold a house & my youngest daughter has grown up into a toddler. While there has been time for gaming, there has been very little time for painting. In fact, I was rather surprised to find my basing sand & flock still packed away in boxes from the move after more than a year. What’s next? My Arab Crusader force needs an opponent. The painting table is full, as I’ve been busy purchasing Normans/Crusaders for a sizable 1st and/or 3rd Crusades force. While I have hundreds of figures at the ready, I think I’ll paint small groups which could also double as a Saga army (in the off chance I get to play with that rule set). Reaper Bones. Like 17,000 other gamers, I bought in to Reaper’s Bones KickStarter. The local club has taken to Song of Blades and Heroes as a light weight skirmish game for all the new figures and monsters. Expect to see a handful pop up on the blog between units of Normans.